Green Day's Billie Joe Armstrong. 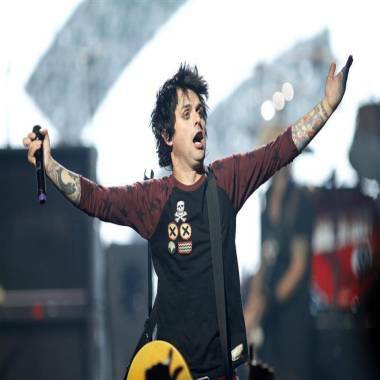 The members of Green Day said on Monday they will return to the road in March after the punk rock band canceled its fall club tour and postponed later dates as frontman Billie Joe Armstrong underwent treatment for substance abuse. "We want to thank everyone for hanging in with us for the last few months," the band members said in a statement on their website. "We are very excited to hit the road and see all of you again, though we regret having to cancel more shows." Armstrong, lead singer and guitarist for the Grammy-winning rock band, sought substance abuse treatment in September following an angry, guitar-smashing on-stage outburst in Las Vegas. The details of his addiction were never specified. "Dear friends ... I just want to thank you all for the love and support you've shown for the past few months. Believe me, it hasn't gone unnoticed and I'm eternally grateful to have such an amazing set of friends and family. "I'm getting better every day," he said. "So now, without further ado, the show must go on. We can't wait to get on the road and live out loud! Our passion has only grown stronger." The tour will begin in Chicago on March 28, with dates in Pittsburgh, New York, Toronto and other cities up through April 12 in Quebec City. The band said it would announce additional West Coast dates in early 2013. Tickets for the postponed shows will be honored at the new dates, Green Day said. Tickets for canceled shows will be refunded at the point of purchase. In November the band moved up the release date of "iTré!," part of an ambitious trilogy of albums that marks their first collection of new music since 2009, to December 11 from its original date of January 15, in part to make up for the canceled and postponed dates. The California-based punk rock band, formed in the late 1980s, has sold more than 65 million records worldwide and won five Grammys, including best alternative album for its 1994 major-label debut, "Dookie," and best rock album for "American Idiot" and "21st Century Breakdown."